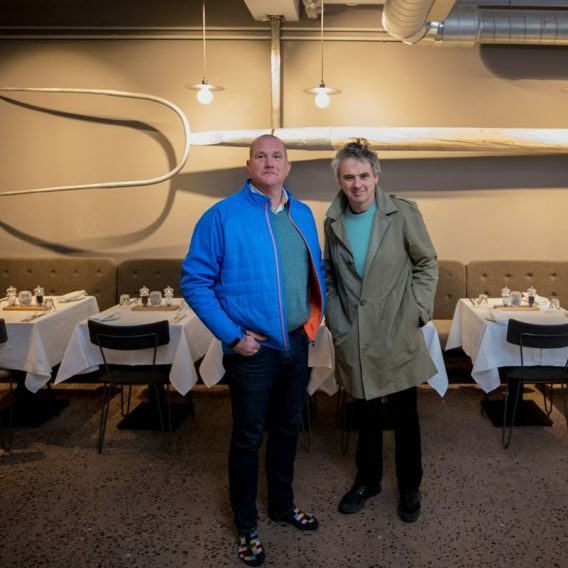 Patrick O’Reilly travelled from Dublin today to view his “Pitchfork” which was installed at “Rachels” restaurant on Washington Street, Cork earlier this month. The piece which was made from douglas fir and steel was sited by Luke Hickson of PLM Architects, Cork & Kenmare. Patrick noted that “the humble pitchfork is one of the most ancient of our tools and has remained unchanged for countless generations. Many simple objects that we encounter in our daily lives have an inherent aesthetic beauty which is sometimes overlooked. By creating a one-off, handmade “giant pitch fork” which has no practical use we are encouraged to appreciate the simple pure form and aesthetic beauty”.